It’s my first birthday as a mommy! 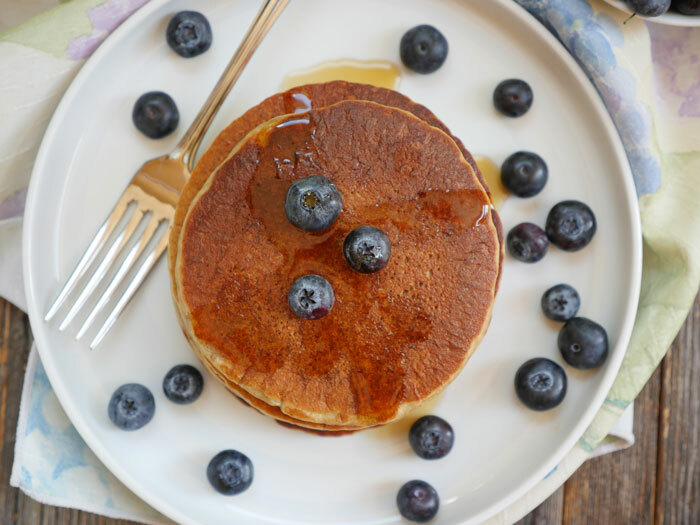 And to celebrate, I’m sharing a recipe that I ate all throughout my pregnancy: 5-ingredient oatmeal pancakes. I even froze several batches of these pancakes to eat after I delivered my babe. 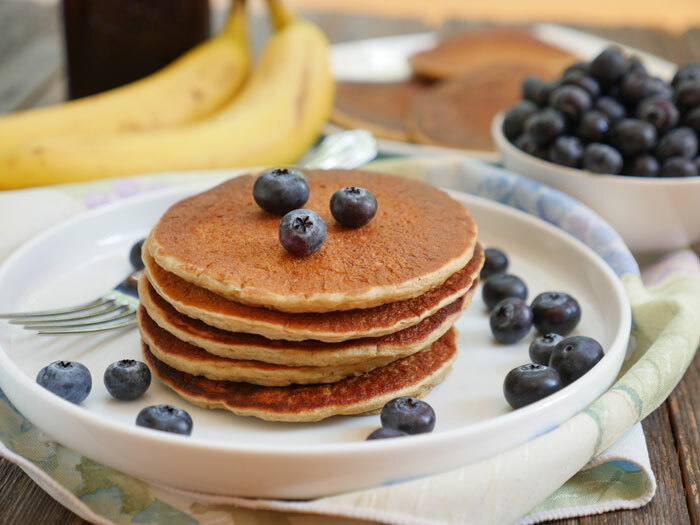 These healthy oatmeal banana pancakes are naturally sweetened, high in protein and fiber and their fluffy factor is on point. Yes, “fluffy factor” is a thing when it comes to pancakes. This recipe is also gluten-free. The 5 ingredients you need to make this: gluten-free rolled oats, yogurt (dairy or non-dairy), a banana, an egg, and a little baking soda. (I buy my gluten-free certified rolled oats from Trader Joes). 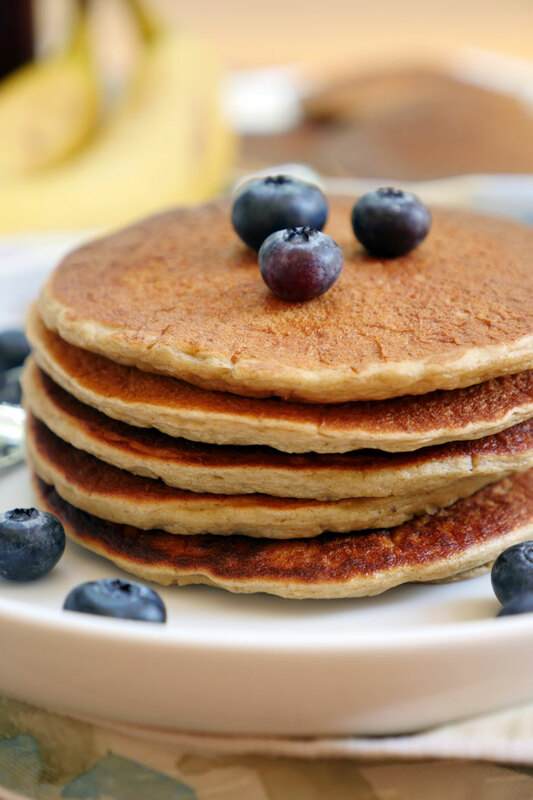 I also suggest adding a tablespoon of golden flaxseed meal to make even thicker, fluffier pancakes. It’s not necessary, but it’s a nice addition. 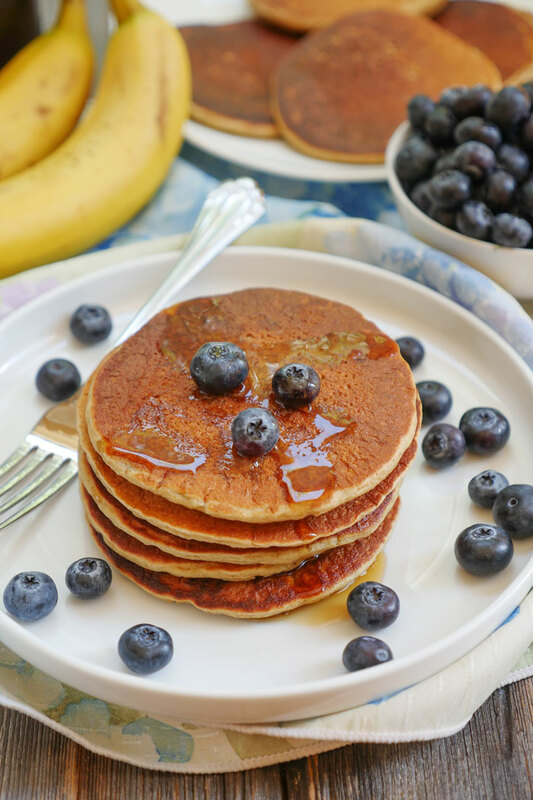 And if you’re a breastfeeding mama – add some Brewers yeast too to make lactation pancakes! If you follow a strict paleo diet, then you’ll want to make my Paleo Pancakes (they’re just as incredible as these!). This recipe is (obviously) for those who can tolerate oats. To make these oatmeal banana pancakes, just blend all of the ingredients together in a high-powered blender, then pour the batter onto a hot crepe pan (I have and love this steel crepe pan). If you’re okay with using a non-stick pan or griddle, that’ll work too. 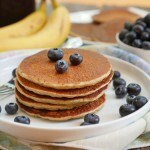 When I was in college, I loved the song “Banana Pancakes” by Jack Johnson. At the time, I really thought that having a guy make me a batch of banana pancakes would be the most romantic thing ever. Well, I ended up dating Roby during my second year at UVA. He won me over by playing Jack Johnson songs on his guitar (that and the fact that I found/find him devastatingly handsome). But to this day… he has yet to make me banana pancakes. Truthfully, I’m not even sure I’d want to eat his banana pancakes now… (if you’re reading this Roby – sorry, sweetie – we know grilling is more your thing). Now, I’m the banana pancake-maker in the family. And, I make darn good pancakes. I also love sharing my recipes, which means you can make darn good pancakes too. Top these darn good fluffy pancakes with some butter, berries and maple syrup! Pour everything into a blender, and blend until well combined. If using blueberries or chocolate chips, fold those in after blending. Pour ⅓ cup onto a hot crepe pan (I use and love this steel crepe pan) or a non-stick pan/griddle. Cook one side until the batter fluffs up at the top (approx 1-2 minutes). Then flip over to cook the other side. I found you last week while looking for a pumpkin curry, which I modified to my taste and preference, and it turned out so wonderful! so thank you for that. 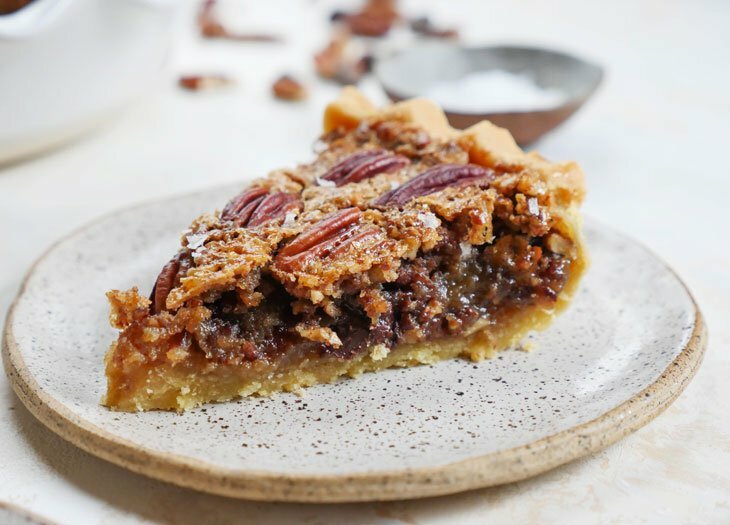 But I forgot to save the link to the recipe and had to re-search it again today and then I found this, and am so glad I did! My batter came out a bit runny and my pancake was more crepe like. But the flavor was spot on! I ended up making a big one, spreading some peanut butter on it, adding a few almonds and rolling it up for breakfast on the go. Next time I’ll try a thicker yogurt, or more oat’s. Or just leave it, cause it was a delicious crepe. You have such wonderful recipes! Thank you! 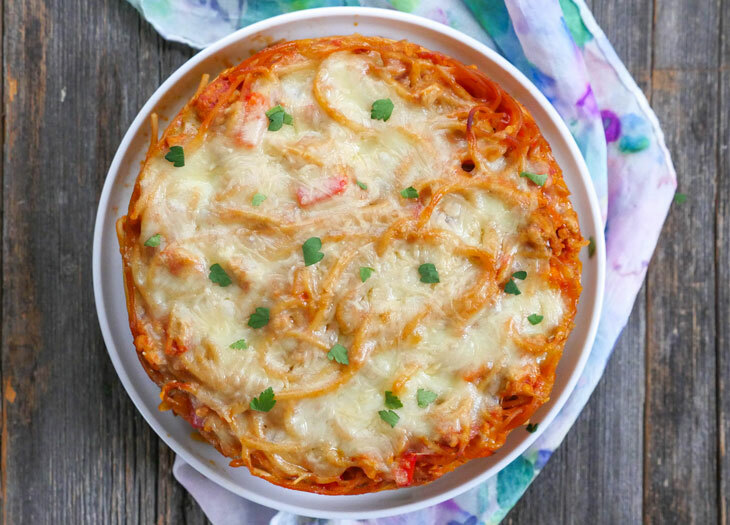 Hi Kris, I’m glad you found and tried this recipe! 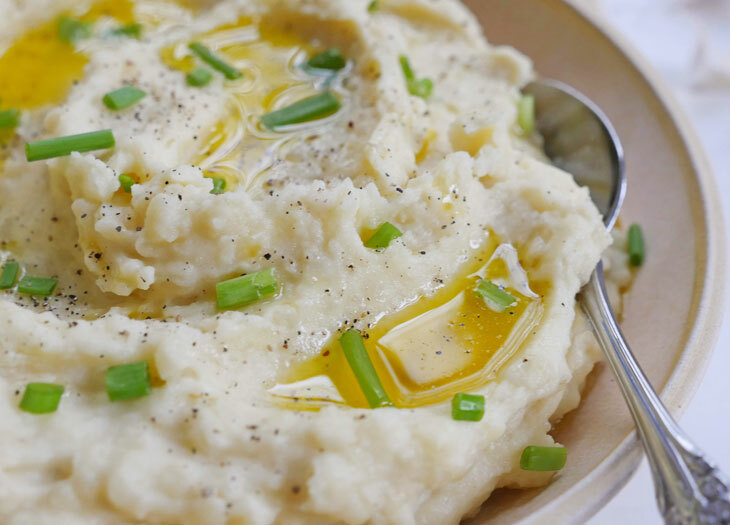 Did you add the optional 1 tablespoon of flaxseed meal? If not, try that! It helps make the pancakes a bit thicker. I was wondering if I can sub the flaxseed meal with nutritional yeast? I have some languishing in my cupboard waiting to be used! Would this help the pancakes be thicker? June, ah no, please don’t do that! Then your pancakes will end up with a cheesy flavor… you can always make my dairy-free nacho cheese or my dairy-free queso to use up your nutritional yeast. Do you think these would work with greek yogurt or would that be too thick? Can the batter be saved to use later? Keep it refrigerated? Use it again when cold?